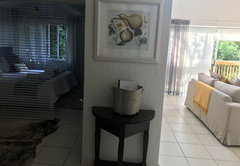 Beach Forest Lodge is a highly recommended property providing self catering in Ballito for tourists visiting the Dolphin Coast region. 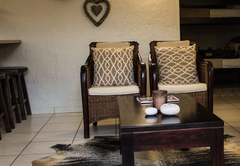 Beach Forest Lodge is situated in the heart of Ballito and has four luxury, spacious self catering apartments. 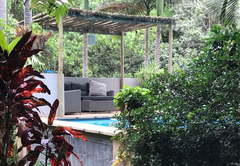 Located just 400m from the beach, we overlook the serene, tropical Pigeonwood Forest and yet are close to all amenities, restaurants and shops. 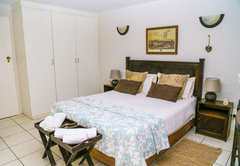 The rooms have fully equipped kitchens are all air conditioned, have fans, flat screen TV’s with multi DStv chanells and free Wi-Fi. 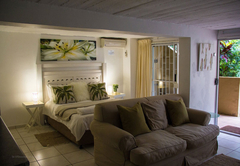 They are nestled in the tropical gardens, each with their own balcony or patio with private braai facilities. 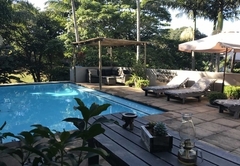 There is a gorgeous pool with an outdoor and indoor entertainment area, plus a large wooden deck for lazing in the sun or resting in the shade. 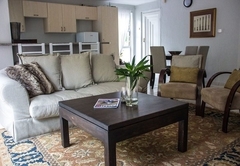 Owner managed, the apartments are tastefully furnished and we pride ourselves on keeping the highest standards. 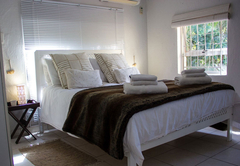 Milkwood is our luxury double volume apartment which sleeps four. 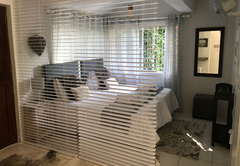 There is an upstairs queen bedroom with en suite bathroom and partial sea views and two single beds downstairs in a separate part of the living area. There are large glass sliding doors all round, giving a wonderful light, spacious feel. 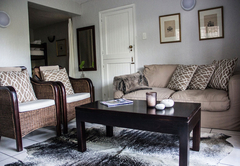 Waterberry is a large four sleeper apartment, which leads out onto a terrace and the wooden deck. 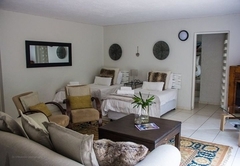 It has a separate bedroom and bathroom with two single beds in the large living area. 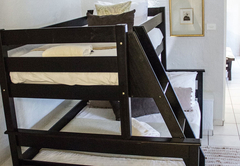 Pigeonwood apartment can sleep five with a tri bunk bed in one sleeping area and a queen bed in the main bedroom. 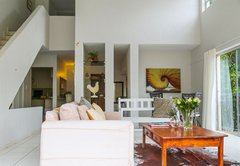 Sliding glass doors look over the pool and there is a balcony with built in braai. 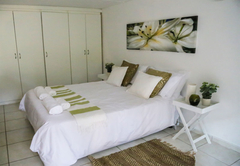 Yellowwood is our studio apartment, which has an open plan living and sleeping area. 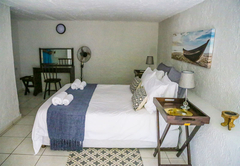 This room still has a fully equipped kitchenette and en suite bathroom. There is a patio with braai. 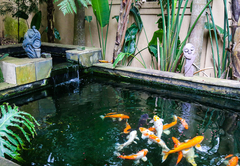 We pride ourselves on being a pet friendly establishment that still gives top priority to the human factor – we try to ensure that your environment is stylish and comfortably furnished, and that our garden areas are a delight to be in. 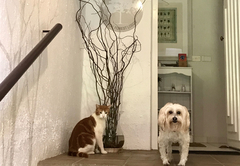 To that end we ask you as pet owners to ensure that you please respect our décor and gardens (no digging or tearing up flower beds!). So we have a few rules that should ensure pet and human happiness (remember not all other guests have pets with them). 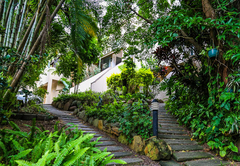 We regret we have no grassed areas as our gardens are tropical with walkways. We have some strategically placed astro turf and there is real grass on the verge! 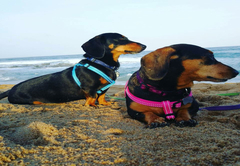 • Please ensure you tidy up after your dog and dispose of any mess in an appropriate manner. Please bring poo bags which we will dispose of appropriately for you. Pets must be housetrained. Please inform management should any ‘accident’ happen indoors. • Please bring towels/blankets/sheets etc. to ensure your pet does not mess/damage the furniture. 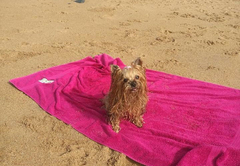 Lodge towels are not to be used on animals. 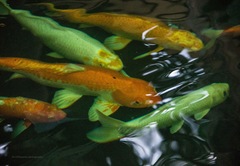 • Your pet must be leashed when walking around on the property. 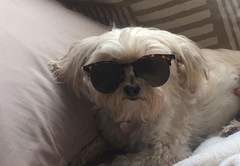 • Please ensure your pets don’t disturb other guests or bark incessantly. We are not a kennels and therefore please keep your pet with you at all times within reason. 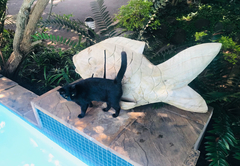 • No dogs in the pool! • For the sake of our own pets and staff we cannot accommodate vicious breeds. 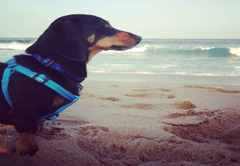 Your dog must be well socialised and be CAT friendly. • Please give your dogs flea pills before your arrival. We are a flea free zone! 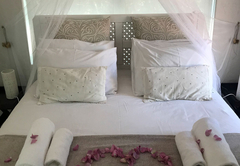 • There is a once off R250 pet charge per stay. • All dogs must be vaccinated, especially against rabies. For your pet’s safety we advise their jabs are up to date. 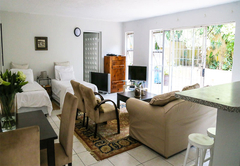 Beautiful double volume spacious with a large balcony and private braai facilities. Queen bedroom upstairs and 2 single beds in the downstairs area. 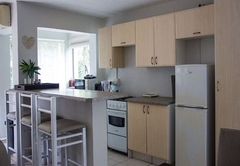 There is a large, fully equipped kitchen. One bathroom with shower. Self-catering. DSTV and Free Wi-fi. 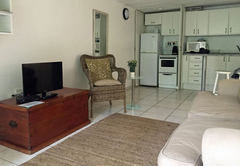 Large living area which opens onto a terrace and decked area with gas or kettle braai. Fully equipped kitchen. Main bedroom with queen sized bed, 2 x singles in living area. One bathroom with shower. Pet friendly. Self-Catering. DSTV and Free Wi-fi. Main bedroom with queen bed and another sleeping area with a tri bunk bed - double on bottom and single on top. One bathroom with shower. Fully equipped kitchen. 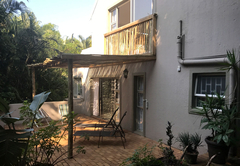 Balcony with braai area. Open plan living space. Pet friendly. DSTV and Free Wi-fi. Open plan space with queen bed, lounge, kitchen and bathroom with shower. 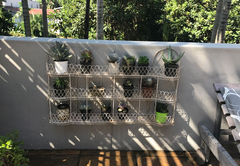 It has its own patio with small kettle braai. Pet Friendly. Self-Catering. DSTV and Free Wi-fi. Space for camp cot for baby. 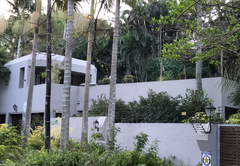 We and our family had a great stay at Beach Forest Lodge. We especially liked that our 2 flats were directly opposite each other so the kids could come straight over to us. Very good thinking of the owner. We had an amazing amount of space for our family of 8 to move around in. 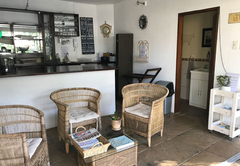 The accomodation was perfect, quiet, and had everything that we needed. The pool area was very nice too. 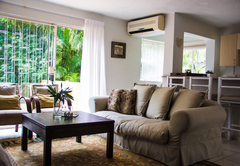 It is not too far from the beach, and only a few minutes by car to the shopping mall. Response timeBeach Forest Lodge typically responds to requests in 5-10 minutes.